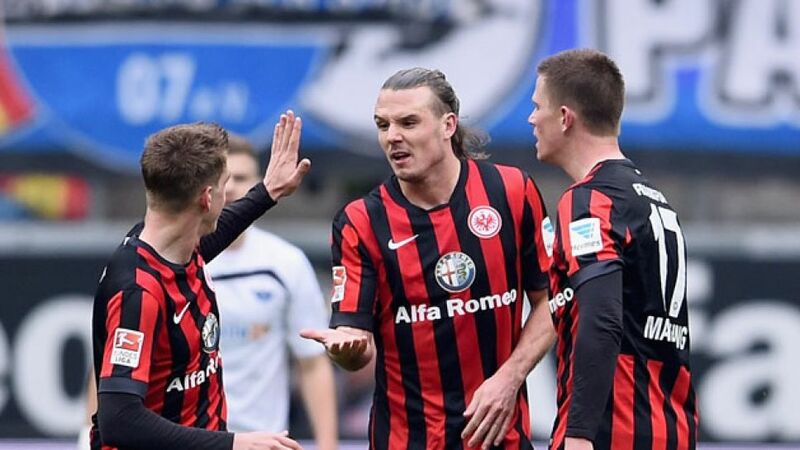 Frankfurt - Eintracht Frankfurt produced a dominant display to emerge 4-0 victors over SC Paderborn 07 at the Commerzbank Arena. The hosts were restricted until the 27th minute, when Bundesliga top-scorer Alexander Meier headed his 19th goal of the season. Marc Stendera, whose cross set up Meier’s opener, capped a fine first-half performance with his side’s second before the break, while in the second period Stefan Aigner was on target before Nelson Valdez celebrated his return from injury with a delicate late chip. Paderborn coach Andre Breitenreiter had demanded pre-match that his side cut out defensive errors and the promoted outfit heeded his message early on, ceding the hosts 70 per cent of possession but no real chances. In the 27th minute, however, Meier, who has opened the scoring more than any other player this season, stooped low to head past Lukas Kruse. The opener was the catalyst for Frankfurt, who created numerous opportunities before Stendera deservedly doubled the lead three minutes prior to the break. In an effort to wrest the momentum away from Frankfurt, Breitenreiter introduced Elias Kachunga and Srdjan Lakic up top. While the duo offered a physical outlet, the hosts underlined their dominance when Aigner, in acres of space, calmly stroked home in the 55th minute. Although Lakic and Meha came close late on, it was subsitute Valdez’s wonderful chipped effort in the 82nd minute which ensured the hosts crowned a perfect day.